This is my favorite kind of food blogging. I thought of something to prepare for dinner on the train back home from work, using what I knew was in my fridge. I prepared and photographed it, we enjoyed it for dinner, and the same night I am sharing it with you all. 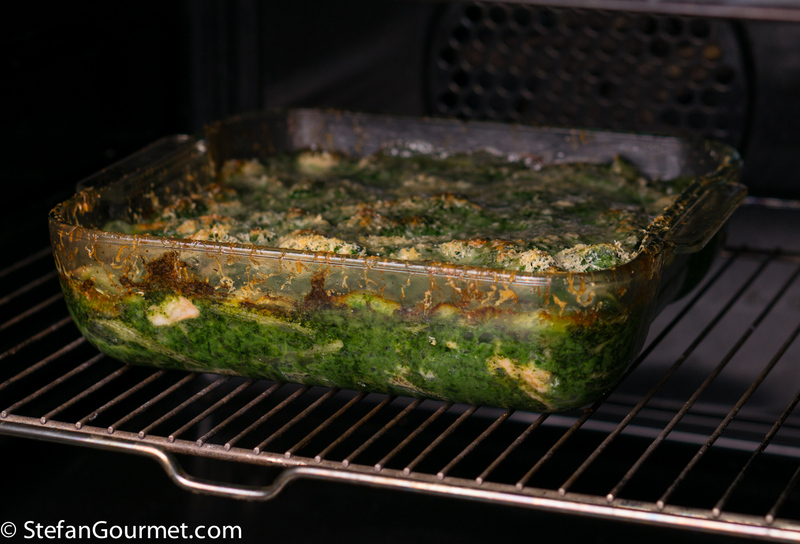 Pasta al forno (baked pasta) is a weekday alternative for lasagne. It took me about 40 minutes to prepare it (including taking the photos), and then it took another 20 minutes in the oven. Start by rinsing and drying the salmon, dicing it, and seasoning it with salt and freshly ground black pepper. 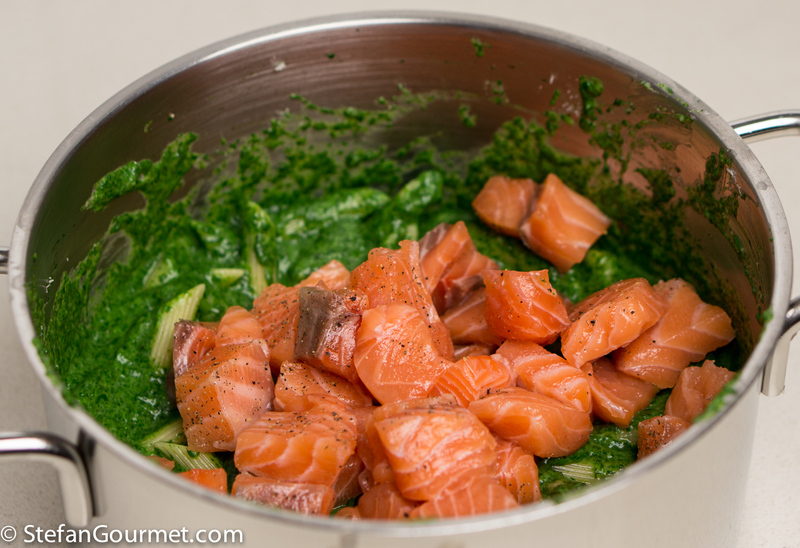 It is important to season the salmon at the start so the salt will have the chance to penetrate into the fish. 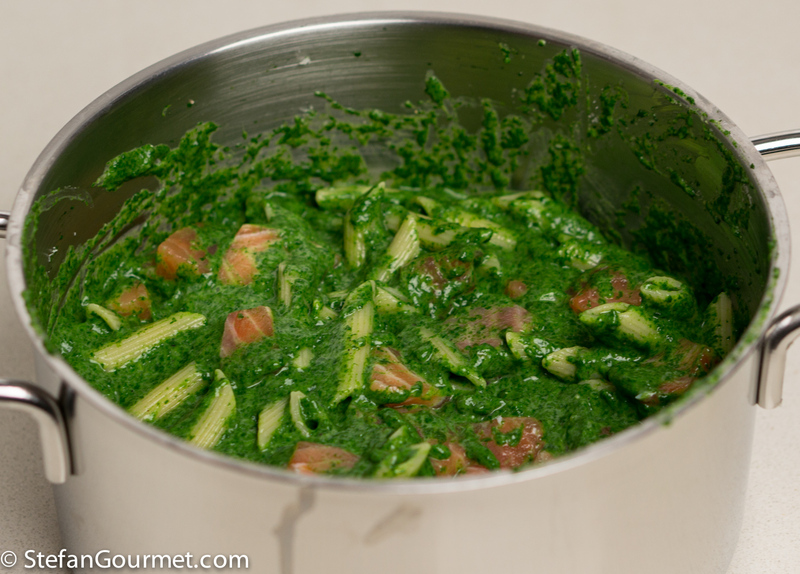 This will make the salmon stand out more in the final dish. …until it is wilted and tender, about 8 minutes. 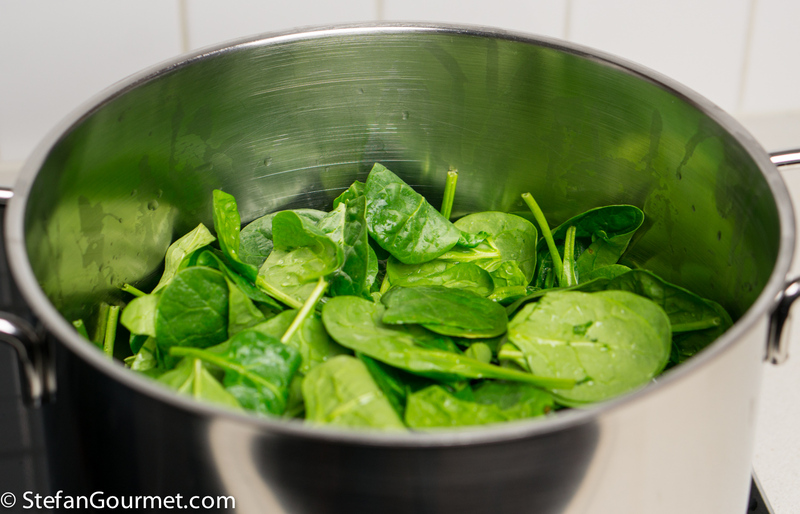 Drain the spinach in a colander or sieve. 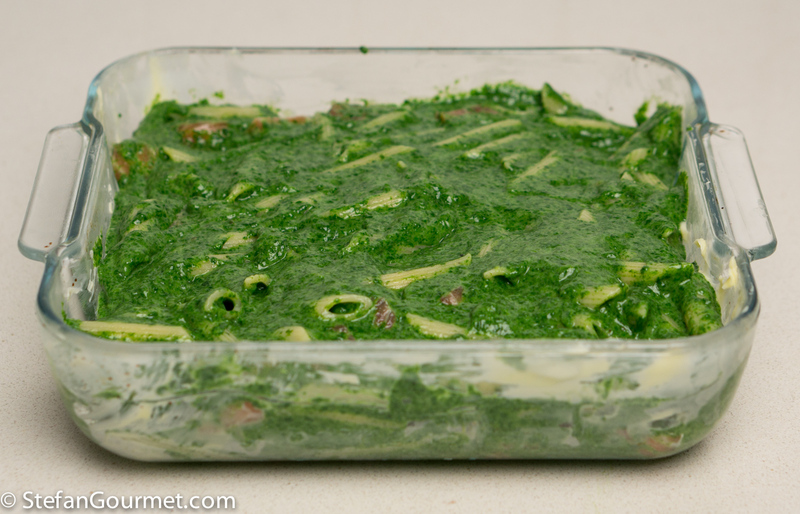 Cook the pasta 2 minutes less than the time indicated for al dente in salted water while you cook the spinach. 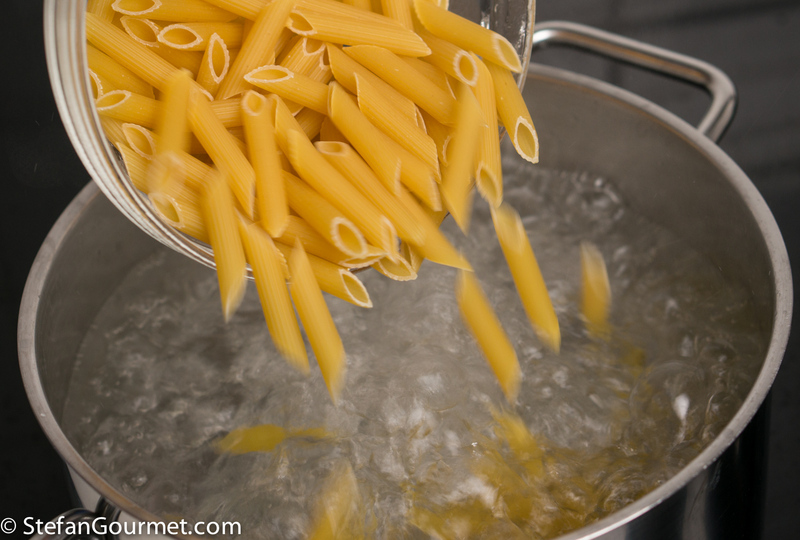 The pasta will continue to cook in the oven, hence the 2 minutes less. Drain the pasta as soon as the timer beeps. 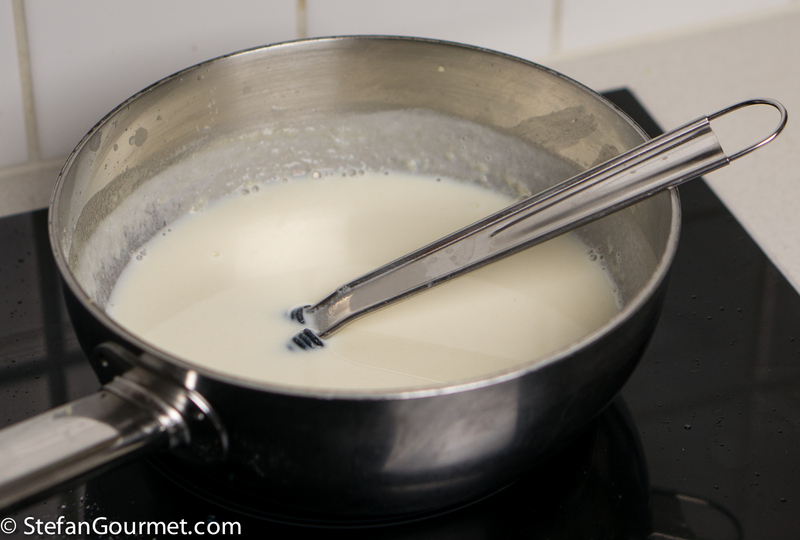 To make the besciamella, heat up the milk in the microwave until there are some bubbles on the edge (it shouldn’t boil). 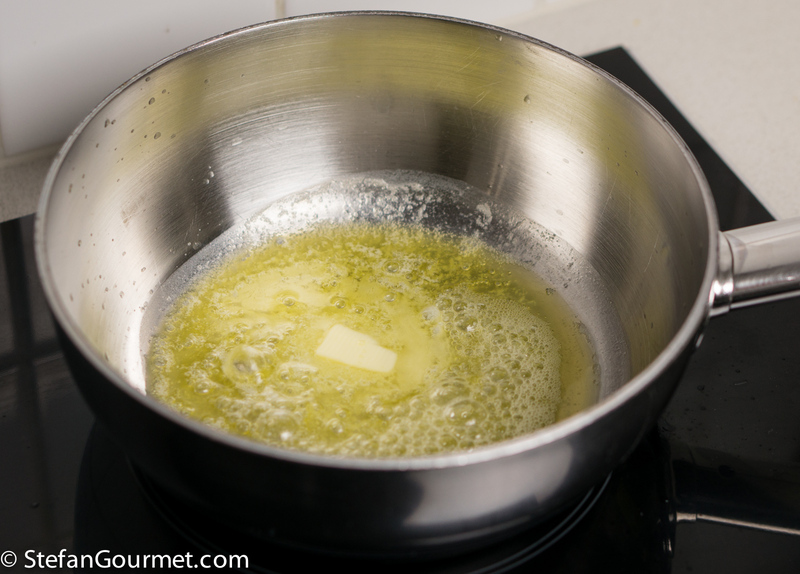 Melt 25 grams (2 Tbsp) of butter in a saucepan over medium heat. 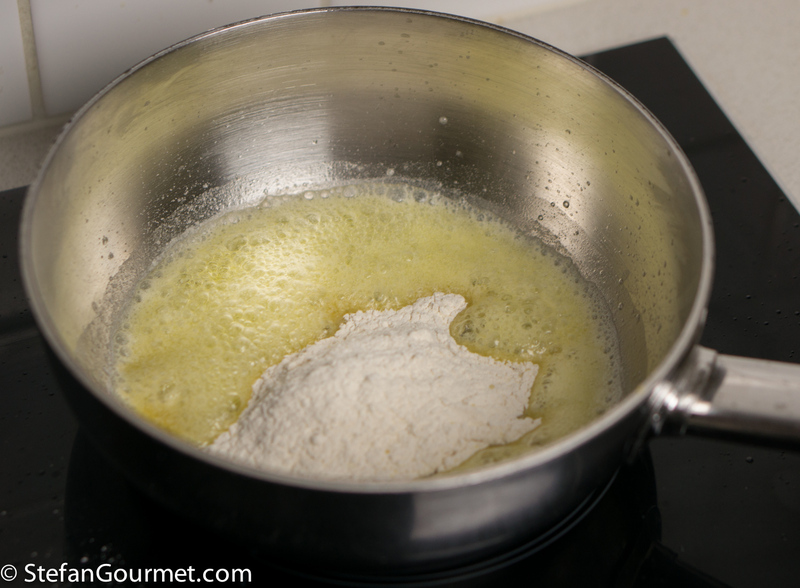 When the butter has melted, add 25 grams (2 1/2 Tbsp) of flour. 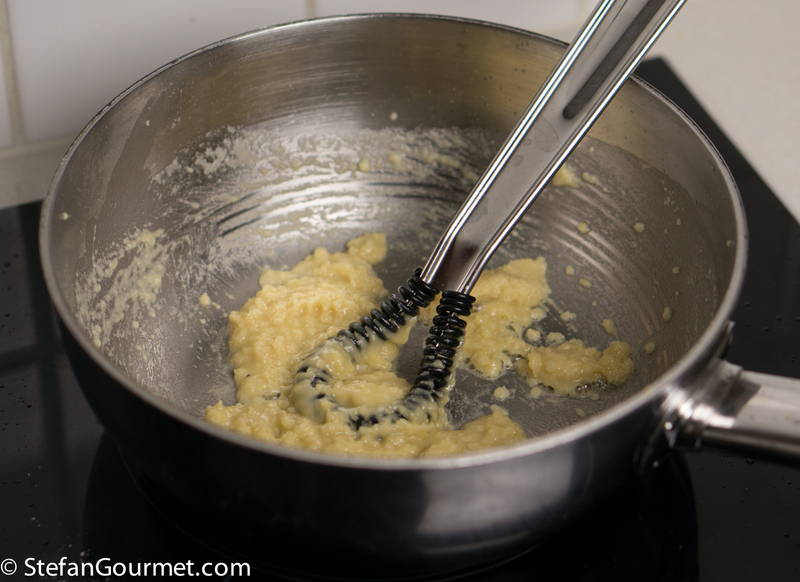 Stir and cook this mixture (called a roux) for a minute over low heat. 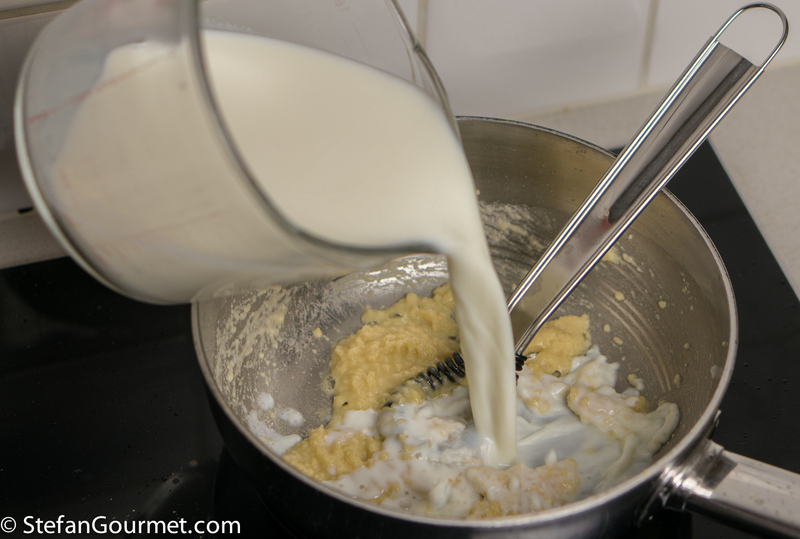 Add the warm milk all at once. Stir energetically to prevent lumps. 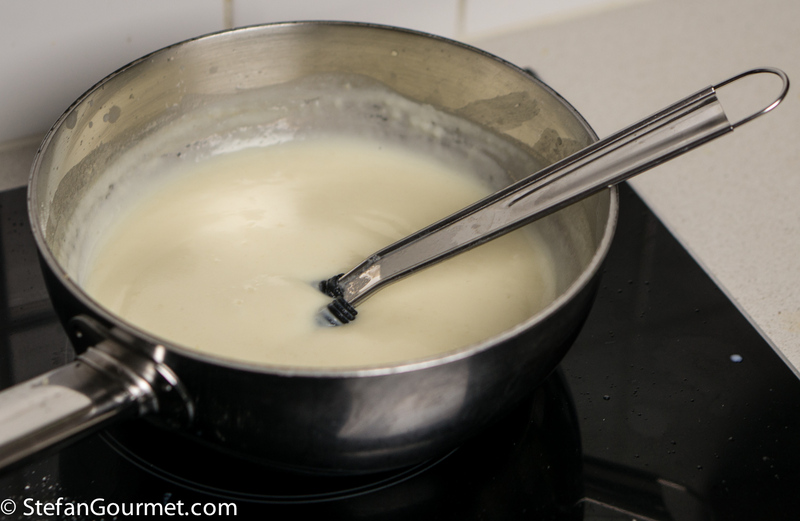 Cook over medium heat, stirring constantly, until the mixture comes to a boil. Reduce the heat and cook for another minute over low heat. 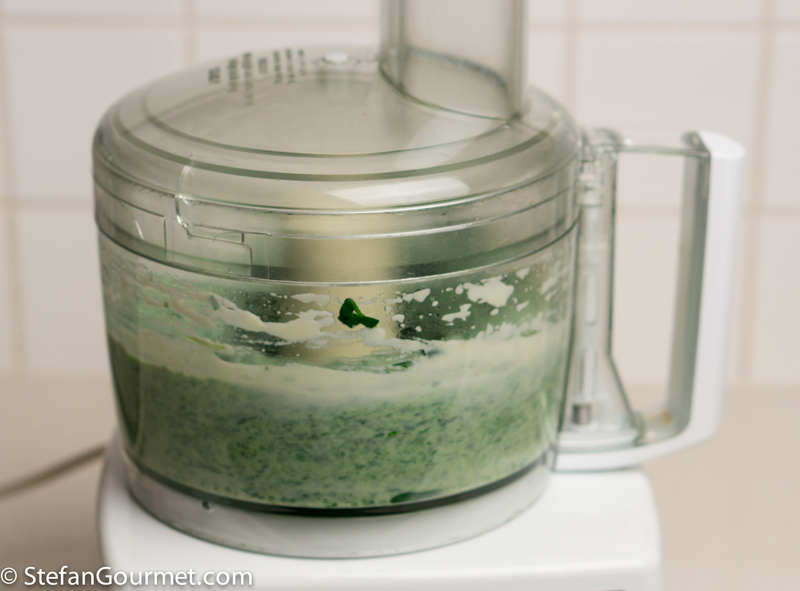 Squeeze most of the water out of the spinach by pressing down on it with a spatula while it is in the colander, then put it in the food processor. 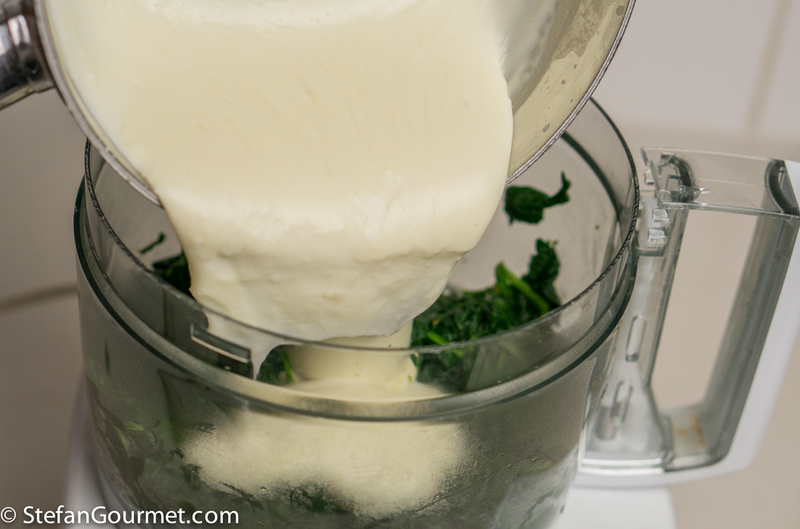 Add the besciamella to the spinach. 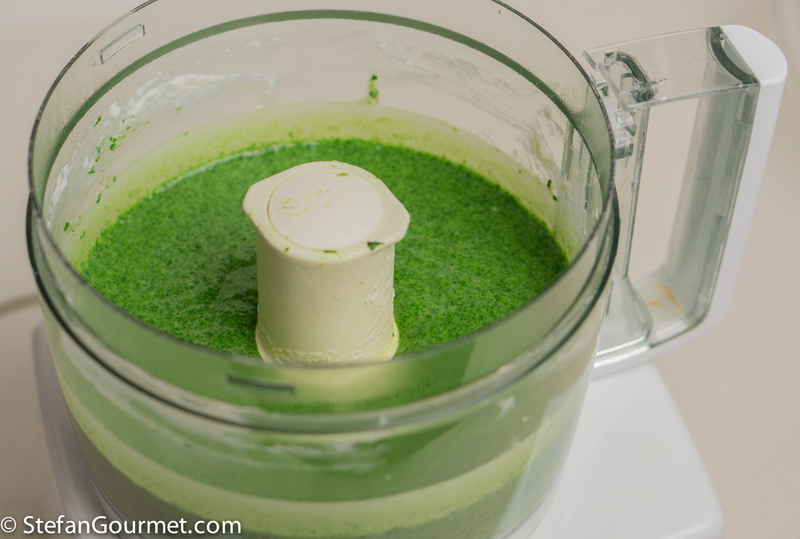 …until the mixture is smooth. Preheat the oven to 200C/400F. 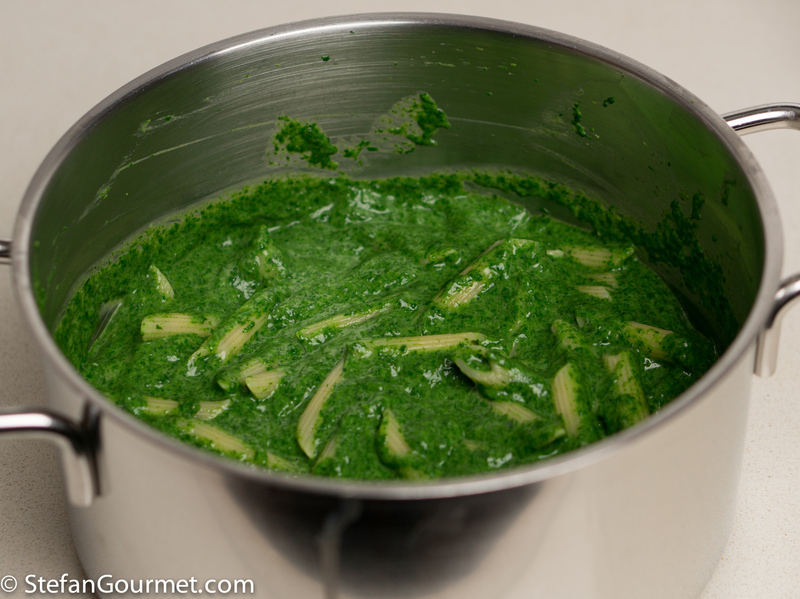 Mix the parcooked pasta with the spinach mixture. 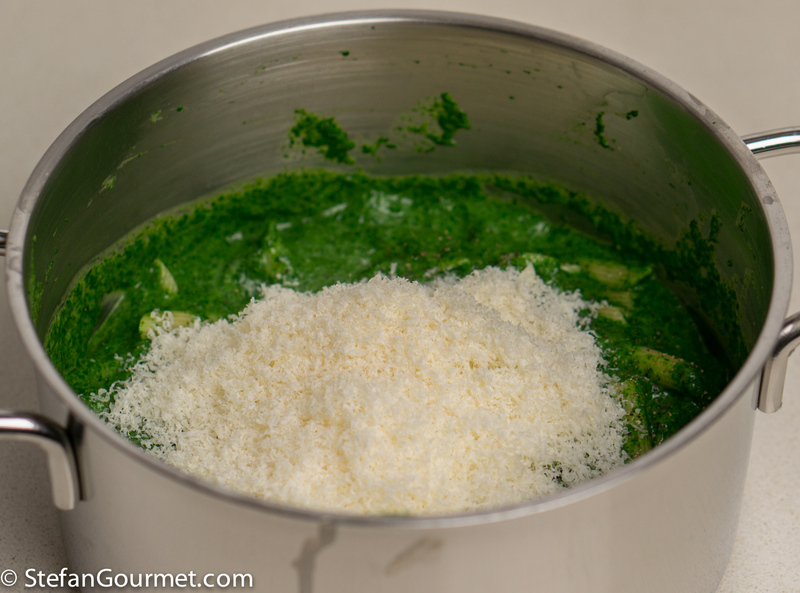 Add a handful (30 grams) of freshly grated parmigiano reggiano. Stir this in, then adjust the seasoning to taste with salt and freshly ground black pepper. 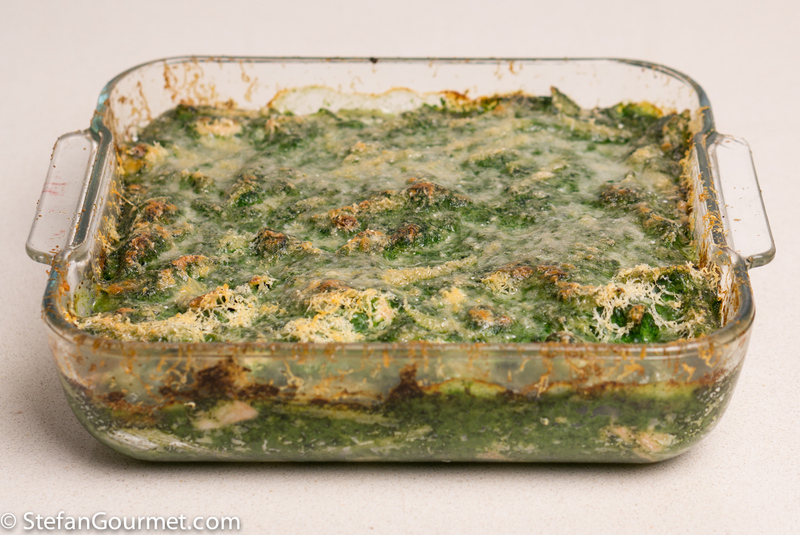 I like spinach to be quite salty. Butter an oven dish, and transfer the mixture to the dish. For 2 servings, I used a 20 cm (8 inch) square oven dish. 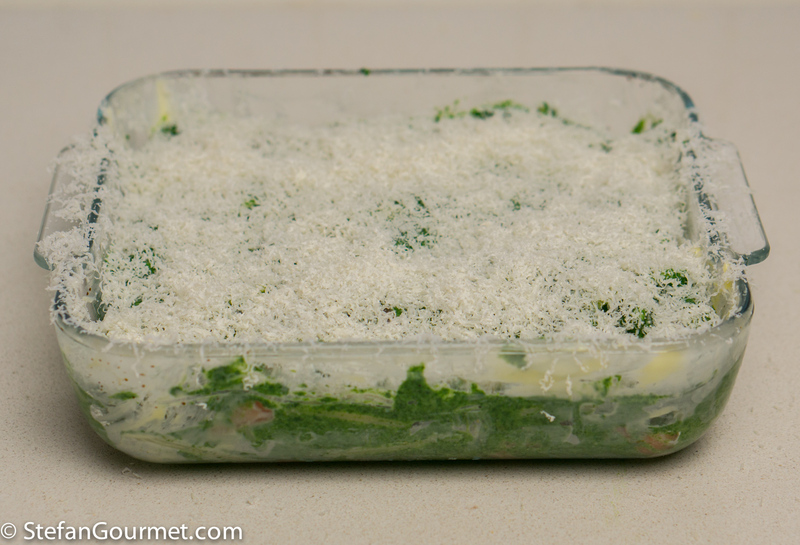 Cover with freshly grated parmigiano. Bake for about 20 minutes at 200C/400F, or until the top starts to brown. The casserole is now ready to be served. 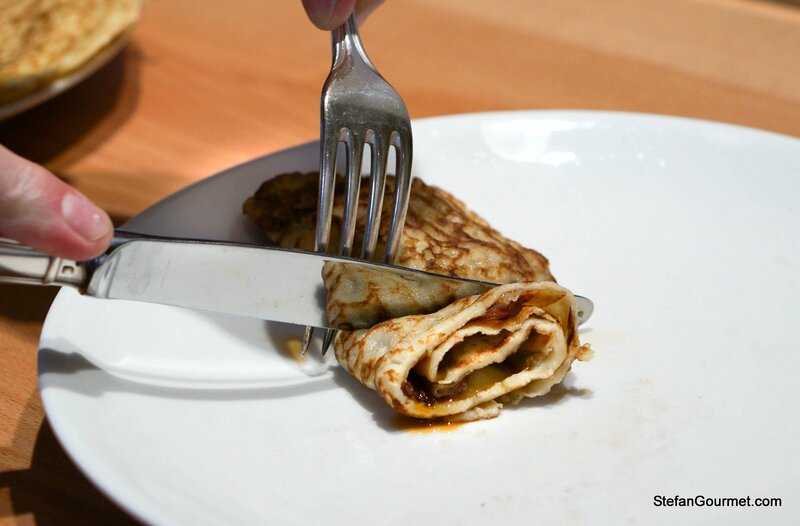 Dutch pancakes (pannenkoeken) are thicker than French crêpes and thinner than American pancakes. They are also delicious. They are Kees’ favorite food, so I make them every year for his birthday. This is definitely something in my skill set I could make one day. It looks delicious! 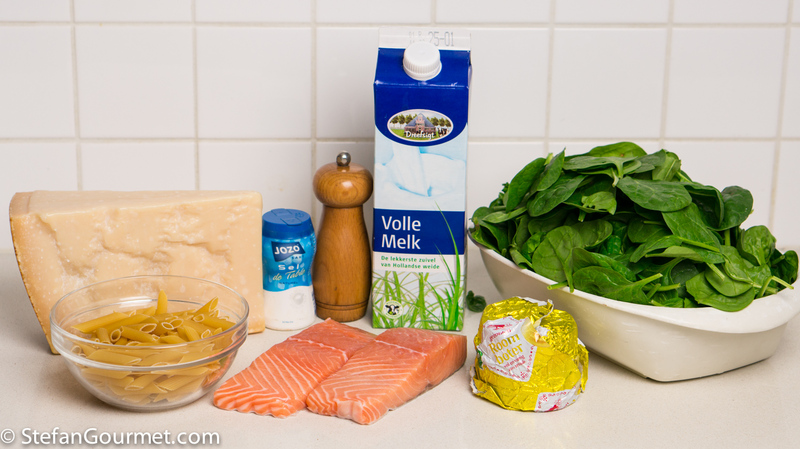 Love the flavor of salmon with pasta, Stefan, and adding spinach to a besciamella can only add to the party. Now,I may have a well-stocked fridge but it is exceedingly rare for me to have 2 such beautiful salmon fillets without a specific use in mind. I can guarantee that my plan would not have been nearly pleasing as your dinner was. When cooking with a fish as strongly flavored as salmon, I don’t think using a bit of cheese is a bad thing at all. In this case, I think it would add a nice flavor to the background, accenting rather than covering the salmon. That is exactly what the parmigiano did. Thanks, John. Questa pasta al forno è davvero invitante. Penso che la rifarò, ho il congelaroore pieno di spinaci. Il formaggio col pesce mi lascia sempre un po’ esitante, ma so che ci vuole! The color looks so fresh and appetizing. Loved your candid blogging style! I haven’t heard of any blogger doing that. 🙂 Have never had pasta with fish, but looks interesting. Simply wonderful, Stefan! 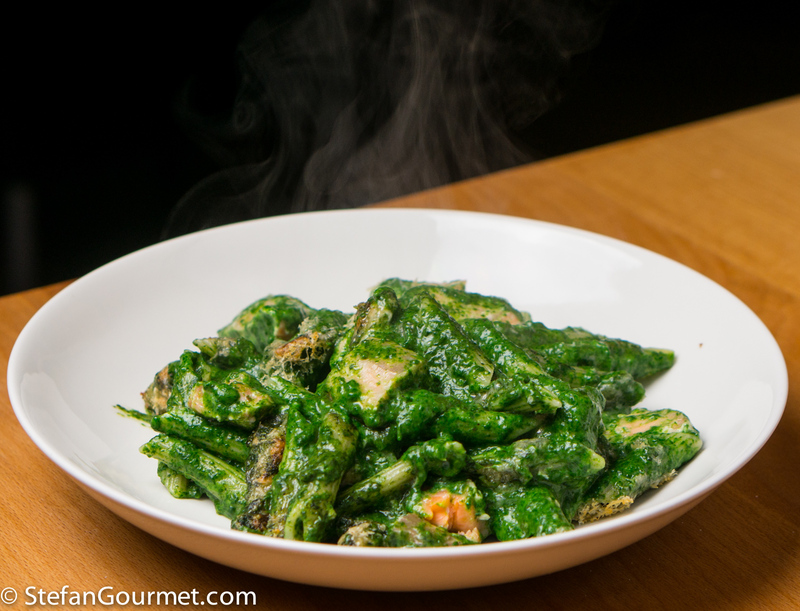 Love the spinach/besciamella combination!